The Department of Chemistry established in 1996 has been imparting training at advanced level of Chemistry in general for M. Sc students and Ph. D Scholars. The research interests of the faculty cover areas, like, Materials Chemistry, Surface Science and Technology, Liquid Crystals, Natural Products and Medicinal Chemistry, Theoretical Chemistry, Synthetic Organic Chemistry, Coordination and Bioinorganic Chemistry, Electrochemistry and Chemistry of Nanomaterials. The Department organises Refresher’s Courses, Workshops and Conferences with support from national level scientific organizations and societies. A number of research Projects sponsored by UGC, DST, DRDO, DBT, DAE, NRB, and BARC, have been undertaken by faculties. The Department has, already, been supported by DST-FIST and UGC-SAP programmes. The Department is equipped with major scientific equipments, like, UV-visible Spectrometer, Fluorimeter, FTIR, TGA, DSC, Polarizing Optical Microscope, Impedence Analyzer, Cyclic Voltammeter, CHN Analyser, Tensiometer High Performance Cluster Computing (HPCC), Polymerase Chain Reaction (PCR) etc. 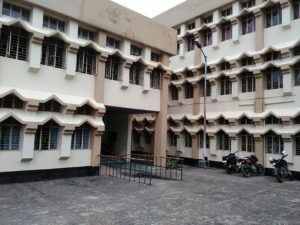 The Department is having a Computer Laboratory and Departmental Library. The Centre for Studies in Soft Matter, established under the aegis of the Department of Chemistry in 2009 under the UGC 11th Plan grant to enrich the academic and research pertaining to design, synthesis, characterization, physical properties and device application of soft materials. The purpose of the Centre is to provide a platform for study and research related to advanced arenas in Material Sciences which is one of the thrust areas of Chemistry Department. Alumni of the Department are now serving as faculty, researchers & professionals in various higher educational and research institutions, industrial organisations in different parts of the country and abroad. Many alumni have also qualified different competitive examinations like NET, SLET, GATE & GRE and they are pursuing various advance level courses of research work including post-doctoral research in many parts of the country.